Send this VIP wine gift. A gift for your most valued clients and colleagues, The VIP Treatment is an exceptional offering of fine wine and food. 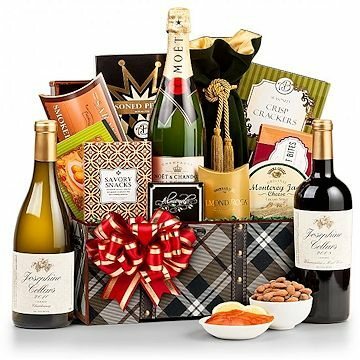 A large stylish chest holds a prestigious selection of some of the best foods and wines designed to impress colleagues, clients, and friends. This item includes the following: Aaron Bell Almonds 1.5 oz, Almond Roca .82 oz, Seasoned Snack Mix 4 oz, Sonoma Monterey Jack Cheese 3.5 oz, Aaron Bell Crackers 3 oz, J&M Jalapeno Cheese Biscuits 2.5 oz, Pretzels 4.3 oz, Smoked Salmon 2 oz, Tiramisu Caramels 4 oz along with the the following wine selections. A gift that helps to clinch the deal every time. Josephine Cellars California Merlot - Smooth and full-bodied, this powerful red wine entices with a deep red color in the glass and rich aromas of cassis, plum, and earth. On the palate, the wine reveals intense, concentrated red and black fruit characteristics and a perfumed style that lingers through the finish. Enjoyable now through 2018. Josephine Cellars California Chardonnay - A soft, easy-drinking, and smooth Chardonnay with velvety layers of lemon zest, green apple, and toasted coconut. Balanced tannins and an infusion of oak lead to a sweet, bright finish. This outstanding California Chardonnay is made in the true Burgundy style and will delight any Chardonnay enthusiast. Moet & Chandon Imperial Champagne - This luxurious, world-famous Champagne boasts soft and mature aromas of white fruits such as peaches and pears with hints of nuts. From a smooth, juicy mid-palate to a clean and crisp finish, the champagne releases heavenly fruit flavors with hints of fresh walnuts. Note: Due to bottle size, the champagne option does not include the velvet wine sack. If any substitutions are necessary, they will be made with items of equal or greater value. Please note that this gift is only available for purchase and receipt by persons over 21 years of age.